If your order weighs less than 13 ounces, save huge on shipping with USPS first class (with tracking number). This product weighs 6.2 oz. 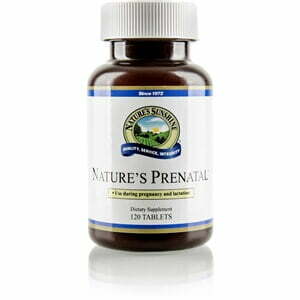 Nature’s Sunshine Nature’s Prenatal supplements the diets of pregnant and lactating women with essential vitamins and minerals. 800 mcg of folic acid, a key nutrient for preventing birth defects, is an important ingredient of this formula. 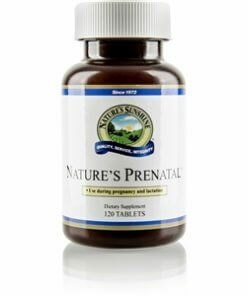 Nature’s Prenatal is a rich source of antioxidants which protect the body from free radical damage. Ginger root, another essential ingredient in the formula and safe for pregnant mothers, helps alleviate nausea associated with morning sickness. This all-natural formula is free of artificial flavorings, colors, sweeteners, preservatives, yeast, gluten, dairy, and wheat. Di-calcium phosphate, cellulose (plant fiber), stearic acid, ginger rhizome (Zingiber officinale), and magnesium stearate (vegetable).